I just love chocolate cups. You can fill them with anything. This time I made PBJ chocolate cups. It’s like having a PBJ sandwich but better!! Chocolate makes everything better, right? 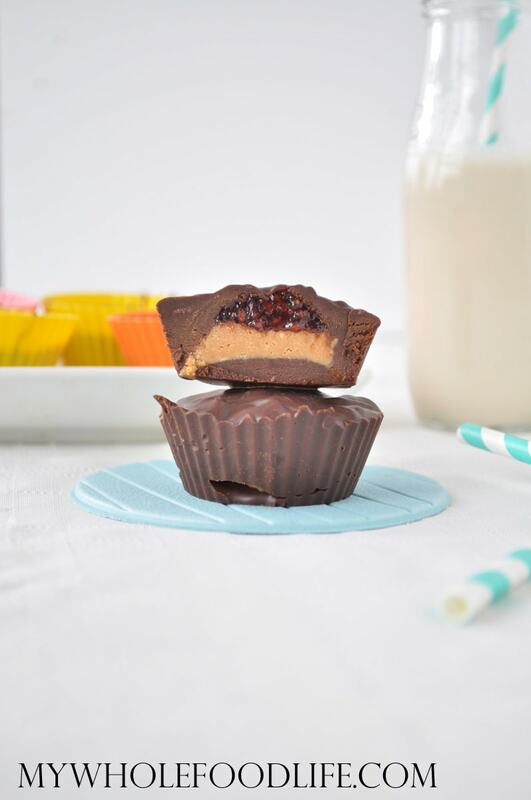 I hope you enjoy these PBJ chocolate cups as much as my family did! If you enjoy this, then you may also like my salted caramel chocolate cups. All you need is 4 ingredients to make these. Super easy. They are vegan and gluten free. If you used almond butter or sunflower butter, they would be paleo as well. If you don’t want to use the chocolate chips, you can use the recipe in this video for the chocolate layer. roughly 1/2 cup peanut butter or nut butter of choice. Melt the chocolate chips and the almond milk using a double boiler method. Once the chocolate is melted, put a little into the bottom of each lined muffins cup. I got 6 standard sized cups out of the batch. Once you filled a little into each muffin cup , place the tray in the freezer for a couple minutes. Once the chocolate is solid, then add a dollop of peanut butter into each cup. Then add a tiny bit of jam on top of the peanut butter. Fill the reminder of each cup with chocolate and place in the freezer to set up. It should take about an hour for the chocolate to be firm enough. Once the chocolate is firm, you can store it in the fridge. Enjoy! Chocolate does make everything better! Thank you for posting a link to the chocolate chips on amazon. Finding ingredients in the store for recipes I find can be a challenge. I usually have to go back twice after I realize I forgot something!